Grey squirrels are an alien species and were introduced to the UK from the USA in the late nineteenth/early twentieth century. Their success has been to the detriment of our native red squirrels. 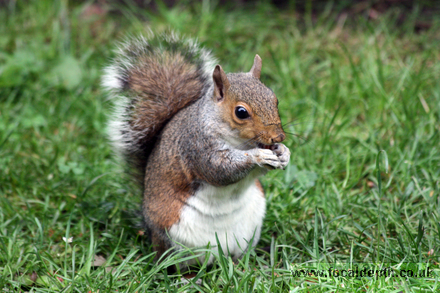 Grey squirrels feed on acorns, tree shoots, flowers, nuts, fruits, roots and cereals. They bury surplus food 2-5cm below the soil or in tree hollows. They feed at ground level, more so than red squirrels, and together with their ability to digest acorns, (which reds can't), they have tended to displace red squirrels in areas of woodland where the two have come into contact.